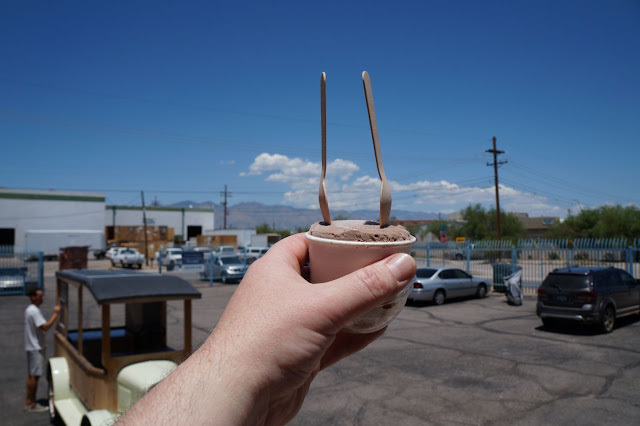 The Tucson Homeskillet: The Tucson Homeskillet Chills With The Good People Over At Isabella's Ice Cream. Well...All Both Of Them. The Tucson Homeskillet Chills With The Good People Over At Isabella's Ice Cream. Well...All Both Of Them. It was a little while ago when we first heard about Isabella's Ice Cream. We were at the Rincon Market, just there to pick up some fish or something, when we came across a curious installment. There was this old timey delivery truck parked inside which turned out to be a sort of ice cream service station. It was a warm day (as most days are here in Tucson anyway) so we figured...why not? Let's grab a cone as we decide on whether to get the snapper or the grouper. Pretty sure we just ended up getting sandwiches at the deli. Anyway, as we were walking around the shop the only solid thing we could make an agreement on was how amazing the ice cream were were eating tasted. The flavors were prefect, even if they were just a solid vanilla and chocolate. Smooth, creamy and very very fresh. Going back to the Model T to get some information we were thrilled to find that this Isabella's Ice Cream was locally made and sourced. Awesome. A Tucson owned and operated business employing locals and putting out an extremely tasty product. Good on them. Later when we were able to do some research on the good folks at Isabella's we were shocked, and dutifully impressed, to find that the only real employees there were the owners and operators: Just two. Yep, that's right. 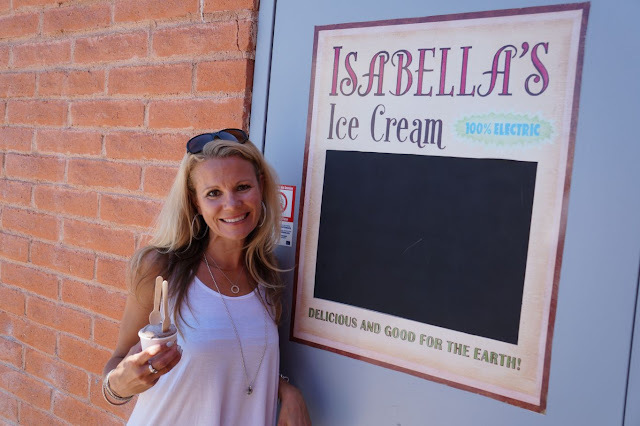 Just two core workers are behind the genius that is Isabella's and because of this the Tucson Homeskillet just had to get down and hang out with them to see how it is all done. Kristel and Dominic Johnson are the force and flurry behind their business. Kristel originally hails from Elmhurst, Illinois but moved to Scottsdale when she was a little girl. Dominic comes from a spot in the Caribbean called St. Lucia and was an Olympic pole vaulter in three separate games. Both of them now call Tucson home, not only because of their business, but because of their family and how they met in the first place. "Dominic and I met at the U of A," Kristel says in their tiny work space just off of 17th Street. "We met through a common friend and started dating during my senior year. Dominic graduated two years earlier but still based his track training at the university with the same coaches he had when he was a student. As for me I just happened to stay in Tucson after graduating." And we are glad they decided to stay here. 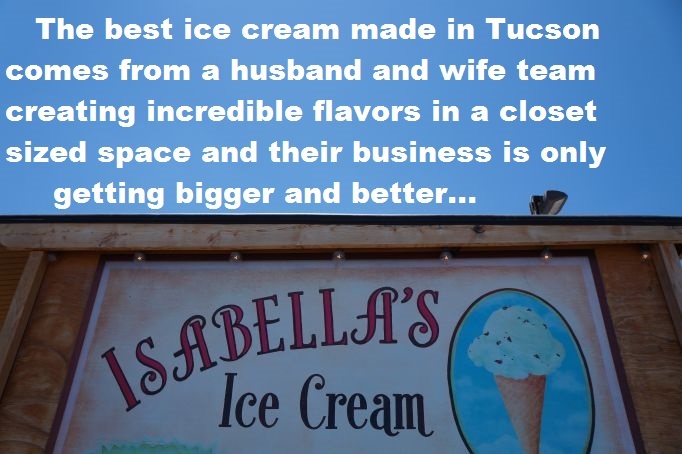 Having Isabella's Ice Cream anywhere else would seem, well...just not cool. Checking out the few machines in their space, we wanted to know how the concept of Isabella's came about in the first place. "Eight years ago, when our daughters were very little, we lived in this big master planned community," sites Kristel, "and one day this super creepy ice cream truck drove by the house. I'm sure you know the type (note: oh yes we do and we know you do to: windowless vans bleating out broke down hurdy gurdy music selling sad faces of super heroes in ice cream formation...yeah, those). Anyway, Dominic saw this and simply said 'Oh there has got to be a better way'. So, initially, our concept was to create a 'non-creepy' ice cream truck. "So we started with the concept of the truck. We wanted to use the beauty and charm of the past and combine it with the technology of today. Isabella's is based on being both socially and environmentally responsible. Then I decided to create a product we feel confident serving to our daughters." Ok, so, the anti creep factor on the ice cream trucks, done. They got themselves a couple of beautiful Model T's, restored them and made them look like something you'd feel safe buying a food product from. Delicious and good for the Earth! "It's all about being environmentally friendly," notes Kristel as she shows us around the various trucks. "These are full electric powered trucks with solar panels on the roof that run the freezers. Our ice cream is literally 'frozen by the sun'...and we just had that term trademarked! "When we bought our first truck there was no engine. Dominic rebuilt the truck and the woody body and replaced it with reclaimed basketball court flooring. Again, this is us being totally green focused. We didn't need to go fast so the trucks top off at 40mph...but go a lot faster if we're going downhill! That is a perfect speed for going around town. "The only downside to being electric is having a driving range of about 30 to 40 miles, so we have to re-charge. If we have events that are more than 18 miles away, we can't drive them there. Another problem is if we forget to charge the trucks. A full charge takes about 8 hours and we just can't pull over and stop for gas." Not only are their solar panels made locally by a company called Global Solar but their freezers are made here in Tucson too by the green energy company Sundanzer. So obviously Kristel and Dominic are really connected to their Tucson green energy and business foundation. Pretty sure they source local for their ingredients when they can right? "Oh of course," nods Kristel in a matter of fact tone. "Living and raising our daughters in Tucson is our choice. Obviously we want to support local as much as possible. It's not always easy and I've had to do some research, but we are very passionate about it. Obviously there are some ingredients we can't source local, such as the cocoa and vanilla beans, but we make sure to source from purveyors who are focused on sustainability. "Tucson has grown our business, embraced us and we are so grateful!" "Ice cream production is a two step, two day process," Kristel instructed when we asked for them to take us on a day-in-the-life-of Isabella's. "Typically we are making a batch or two, or three or even four, of ice cream in the pasteurizer, or churning, the ice cream. Our pasteurization process involves combining the fresh ingredients, the milk, cream, egg yolk and sugar, into the pasteurizer. Once the 36 gallon batch reaches a temperature of 160 degrees, we "pasteurize", or hold the temperature, for 30 minutes. 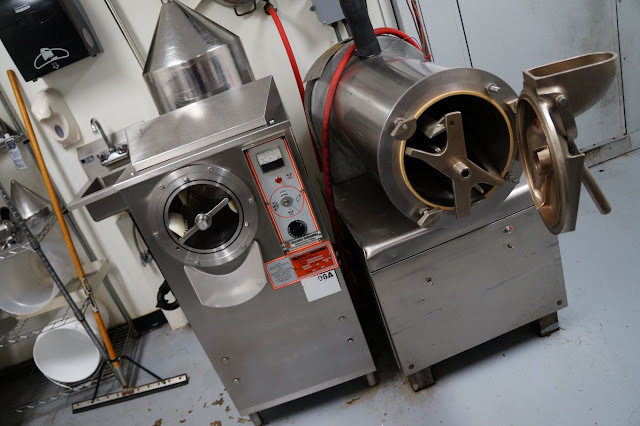 "We then empty the pasteurizer into 3 or 5 gallon buckets and add the ingredients such as vanilla beans, dried lavender, hand made caramel, for example. The ice cream ages overnight in the cooler and then it is ready to be churned. 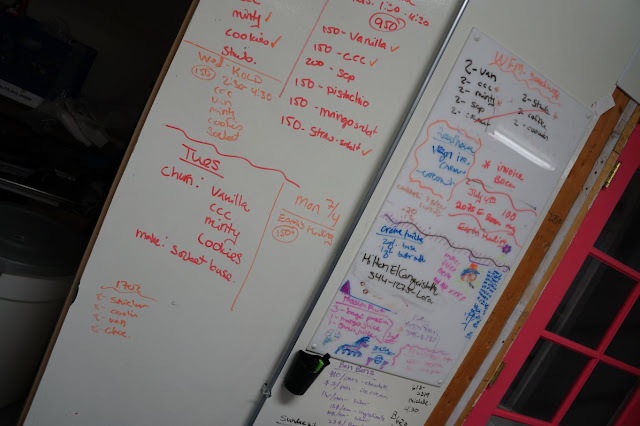 "We churn our ice cream in either a 3 gallon batch freezer or a 10 gallon batch freezer and both take approximately 8 minutes to churn and freeze the ice cream. Once completed, the ice cream has the texture of soft serve. We then put the ice cream into single serve containers, 1.5 gallon pans or 3 gallon containers depending on the order we are fulfilling. If our team is working very hard, we can stuff 1,000 pints of ice cream in about 4 to 5 hours! "We are always moving at the creamery, very little down time. Mondays through Thursdays are typical production days and Fridays through Sunday normally are catering events with the trucks. So there is never a set day off." Whew. Just listening to that made us tired. We always knew that running a small business was challenging but a small business that is gaining in popularity with a limited staff is even more exhausting. Other than time and space constraints, we wanted to know what other obstacles Kristel and Dominic face on a regular basis. "The heat!," Kristel immediately blurts out. "Summer in Tucson is brutal and our business goes up and down. July is usually dead as is January, that is until the gem show starts, so it's a rollercoaster for production planning, logistics, stuff like that. 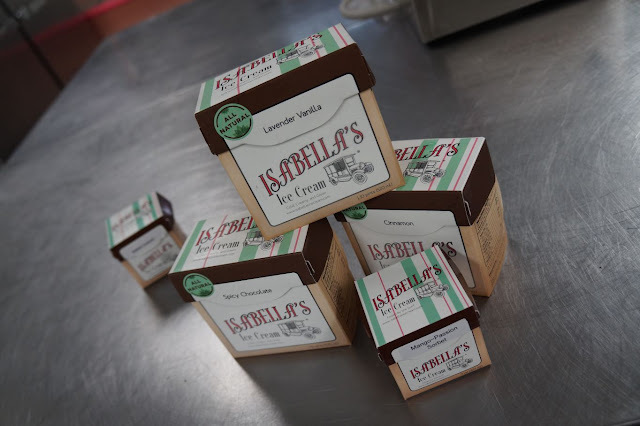 "We are also focused on the distribution of our products throughout the southwest, so once the ice cream is loaded onto a delivery truck and is shipped across the desert to California, Nevada or even across the Pacific to Hawaii, yes!, Isabella's is now going to Hawaii!, we have no control over that. So that makes me nervous. "But ice cream is fun!" she chirps up. 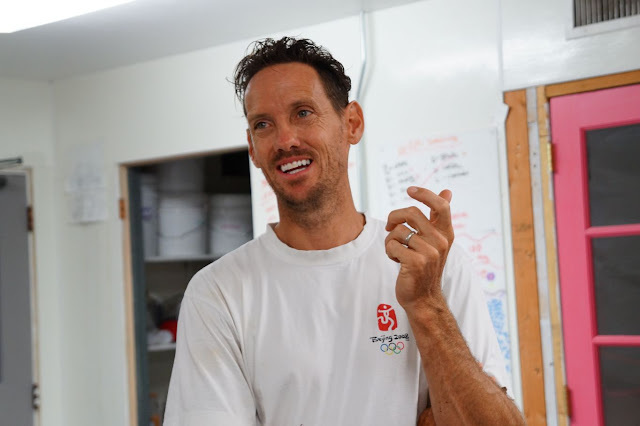 "It's busy and stressful running all aspects of the business as it grows and we've had to figure out a lot along the way, but it's amazing to see a concept that we just 'thought up' literally come to fruition. "It's also incredible to think about all of the people that are buying and eating the ice cream that I personally created. That is a huge compliment!" During this whole time hanging out with Kristel and Dominic we were lucky enough to get to sample some of the goods. They had a whiskey chocolate that was unreal and a cinnamon swirl that was totally outrageous. But out of all of their creations we just had to wonder what they consider their signature flavor. "Oh, it's the lavender vanilla, by far," Kristel pops with a confident smile. "Probably followed by the salted caramel pecan, which is super popular." We had both and we couldn't decide either. 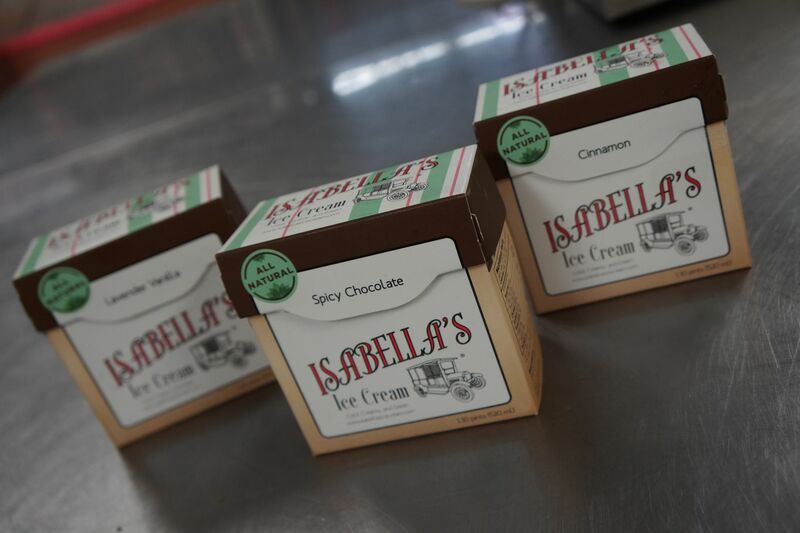 We're sure you will do the same because all of Isabella's creations are delicious. It sort of took us back to being at the market: Do we want salmon or carp? Vanilla or chocolate? Better get one of each because it's all so so tasty. Just where do you see yourselves and Isabella's in the next couple of years? 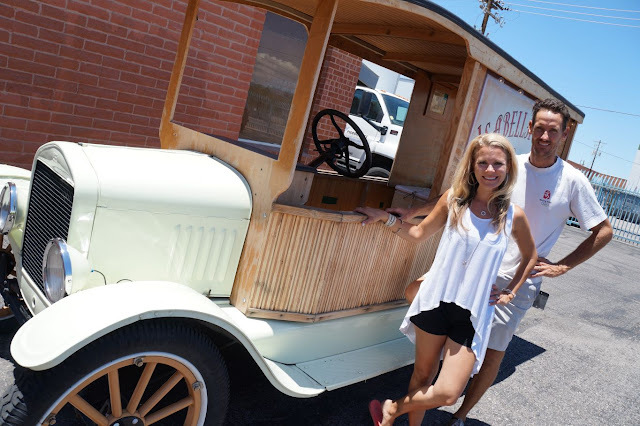 Kristel tipped her head a bit and said with a nod, "Our focus now, over the next couple of years, is to franchise our trucks in the same market, here in the pacific southwest, as we have our ice cream in. 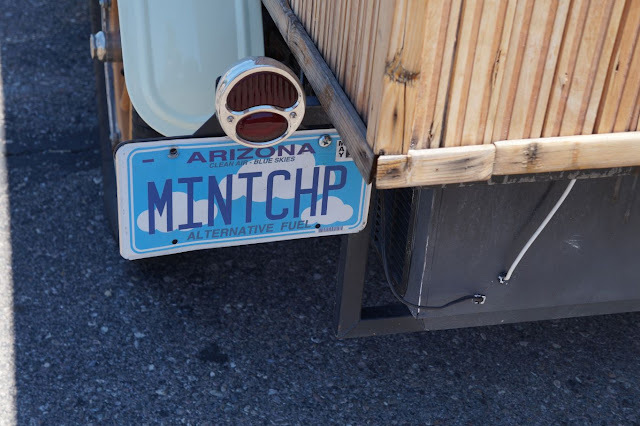 We want people to buy our ice cream at the stores, hire the trucks for catering and parties, buy from the trucks at various food truck events, not only here in Tucson but other cities as well. In California and, well...who knows? "We just want to be the non-creepy ice cream truck in your town." By the way, the company is named after one of their daughters. Did we mention that? Well...now we did. Not only are the trucks not creepy but the ice cream itself is far from being grody as well. Far far from it. In fact, it is some of the best ice cream we have had here or anywhere else on our culinary adventures. And that is saying a lot. You can find Isabella's at (obviously) the Rincon Market but also at Johnny Gibson's downtown, Time Market, and the Food Conspiracy Co-Op. Plus you can purchase their stuff in most Whole Foods across Arizona, Nevada, California and now Hawaii. How amazing is that? You can also get some Isabella's when you're at the Loft Cinema, The Hilton El Conquistador, Renee's Organic Oven, 1702 Pizza, Leura's Mexican Food, Augustin Kitchen, Seis Kitchen and Boca Tacos y Tequila. 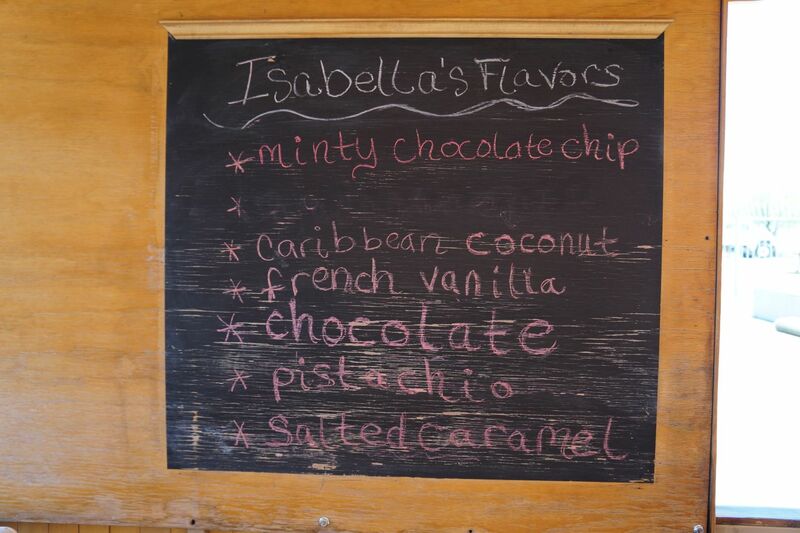 To see where Isabella's are going to be for food truck events, you need to follow them on Facebook HERE. Thank you Kristel and Dominic. Your ice cream rules, your environmental vision and activism rules and, above all, you guys rule.